Ria Loves Pawlish: OPI Wooden Shoe Like To Know? glad to be back to the Holland collection! technology is awesome... until it's not! i'm so glad i was able to get the pictures off the disc... i honestly have no idea how i got the picture to save. craziness. today's polish is OPI Wooden Shoe Like To Know? from the 2012 Holland collection. 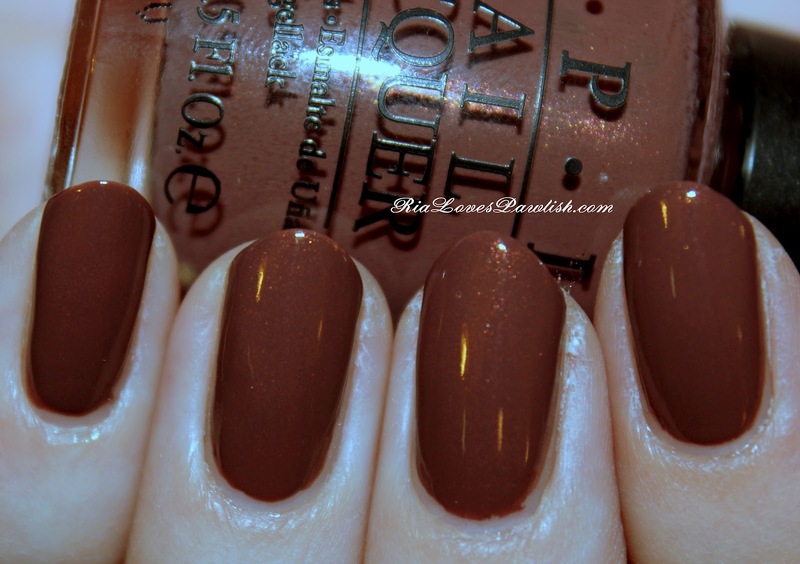 i didn't expect to like this as much as i do because brown is usually not my go to color at all. it's a beautiful chocolatey brown that looks like a cream... but it is subtle shimmers that surprise you every once in a while! i had to edit the picture a lot to get the color right, so the photo looks a little funky. it's still not exactly the same color, but it's as close as i can get! it's a little darker than the photo... are my fingers totally wonky colored or what?! good news :: the formula was really easy to work with, just like all the other polishes in the collection! i only used one coat of SV as the topcoat, but if i were going to wear this out instead of just swatching i definitely would have added another coat to make the color really pop!